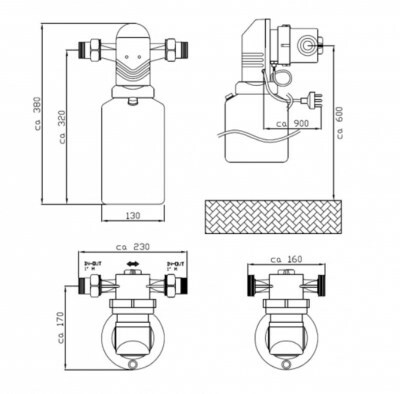 The Acqua Brevetti BravaDos 1" Liquid Water Softener is a compact volumetric proportional mechanical dosing pump water softening system designed to fit onto 1" or less pipes. The system simply fits onto the rising main pipe or any pipe supplying a particular device, such as a boiler. The MiniDUE adds the precise dosage of AcquaSIL Liquid to water. 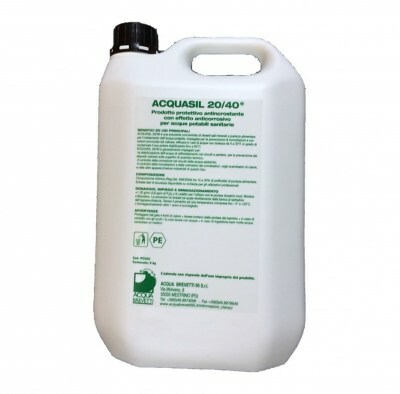 AcquaSIL is a 100% safe, food grade polyphosphate used specifically for the treatment of drinking water. 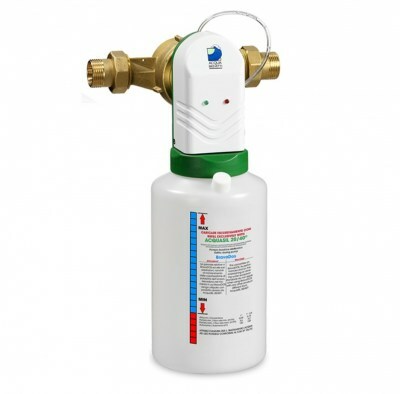 MiniDUE provides limescale prevention and corrosion prevention within the systems such as boilers, heaters, showers, taps, radiators, coffee machines, all plumbing fixtures and so on. The MineDUE is a great alternative to a water softener due to it being very easy to install and to maintain as replacing the pouches is very simple and quick. The system takes up very little space compared to a traditional softener and the cost of maintenance is lower too. BravaDos is a self-priming mechanical volumetric pump that is operated by a turbine which in turn transmits the movement to a special cam shaft that enables the liquid to rise from the refil bottle to the injection valve, where it is injected a small amount of AcquaSIL Liquid into the water as it passes through the pipe. Because BravaDos uses a liquid solution we guarantee a sludge free operation. MiniDUE is fully compliant with European Approval EU 98/83/CE for use with drinking water. and is approved by the Italian water quality approval board under DM, no. 174, 06.04.04. The Use of AcquaSIL and specifically the use of Polyphosphates is covered by the standard UNI 8065, part 5.4.1 which indicates the use of polyphosphates for the treatment of scale deposits and corrosion. No need to put in by pass or drain the system during refill operations; just replace the flexible liquid into the container. Lime deposits and corrosion are crucial problems affecting hot and cold sanitary water installations. The proportional dosage of anti-scaling and anti-corrosive products is a safe and proven technology which helps in preventing scale deposition and corrosion processes. Polyphosphates, even at very low concentrations, are able to counteract the formation of scale and corrosion in water distribution lines. 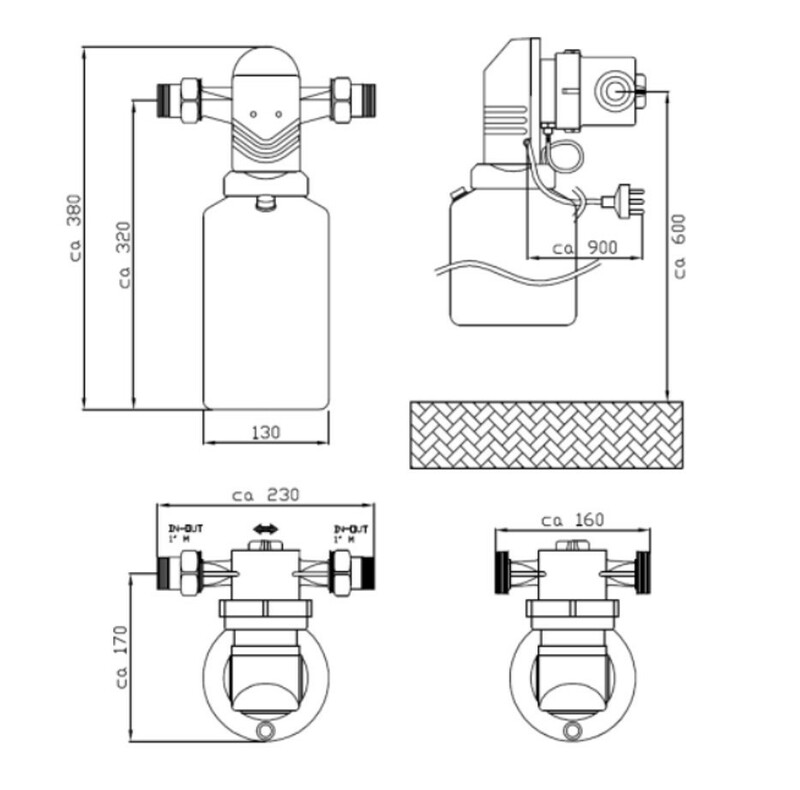 BravaDOS is a proportional electronic dosing pump designed for the precise dosage of AcquaSIL 20/40® an aqueous solution of food grade polyphosphates specific for the treatment of drinking water which prevents scaling and corrosion of hydraulic systems. BravaDOS assures a dosage lower than 5 mg/l of P2O5. BravaDOS is a self-priming electronic volumetric pump in which pumping is controlled by an automatic electronic board which assures a dosage proportional to the water flow rate. Through a mechanism known as “threshold effect”, polyphosphates, even at concentration in the range of some ppm interfere with the carbonate crystallization phenomena hindering the formation of scale deposits. Polyphosphates also form a protective layer on metal surfaces protecting them from possible corrosion. AcquaSIL 20/40® is able to slowly dissolve old lime deposits restoring encrusted surfaces.